Meet with the city’s best designers, architects, contractors, retailers and craftsmen to take your project to the next level. 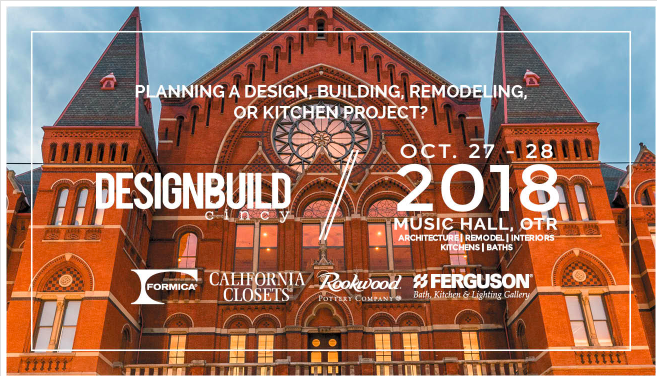 DesignBuildCincy is a curated, intimate design industry show open to the public and gives you the opportunity to meet artisans and fabricators who can build anything. BUY BEAUTIFUL HOME DECOR AND FIND A DESIGNER OR CONTRACTOR FOR YOUR NEXT PROJECT. From kitchen designers to cabinetmakers, architects to remodelers, ironworkers to artisans, see companies you would not normally see at other Home Shows. Our location at Music Hall offers a neighborhood as inspiring as the work exhibited in the hall. Take a walk in the neighborhood, visit local restaurants, shops and parks, drink in the beautiful architecture and be inspired. Shopping for furnishings or fixtures? Meet retailers, designers, artisans and makers who have products for sale and for order at DesignBuildCincy.